Let's resume our tour of Newark's most interesting street, Martin Luther King Boulevard, formerly known as High Street. As readers know from the title of this feature, MLK Boulevard used to be called High Street. 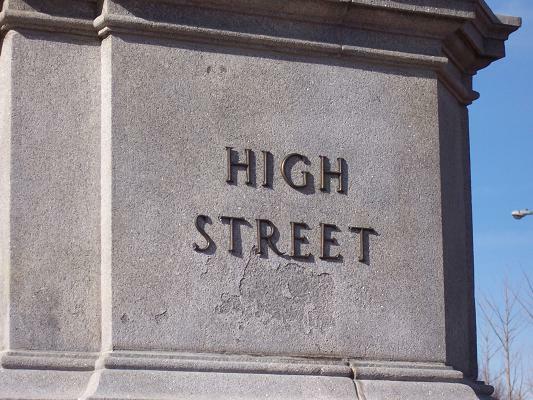 According to Charles Cummings, "High Street" was a common name in English towns, even among towns build on flat land. High Street was renamed for Martin Luther King in 1982/1983. The lateness of the name change surprises me, since Newark had a black mayor by the early 1970s. By contrast, Richard J. Daley of Chicago, not known for racial sensitivity, renamed a major street for King immediately after King's assassination. 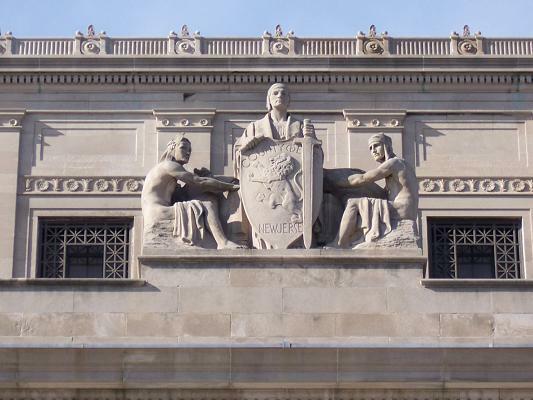 The Essex County Hall of Records was designed by Grant Behee and finished in 1926. 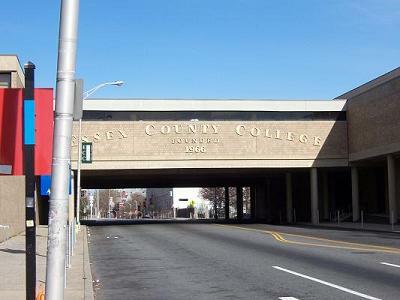 Essex County College, the first of three institutions of higher education that we will come across, reminds you of its history with this sign reading "Essex County College 1966." Actually, this campus of Essex County College does not date from 1966. Originally, ECC was located downtown. This outer-downtown ("University Heights") campus was finished in the 1970s. Next up from ECC is Rutgers-Newark. Rutgers-Newark was formed in 1946 when the legislature made the University of Newark a state-supported part of the Rutgers system. 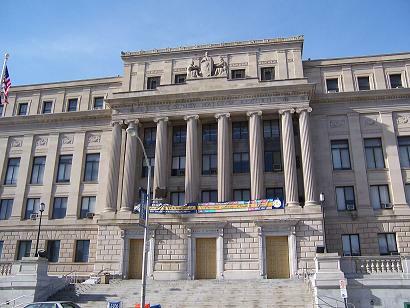 The University of Newark was itself the union of Dana College, the Newark Institute of Arts and Sciences, the Seth Boyden School of Business, the Mercer Beasley School of Law, and the New Jersey Law School. 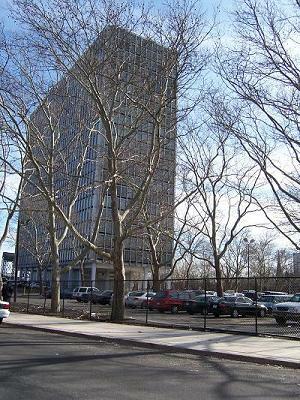 Rutgers-Newark was built in the late 1950s/early 1960s on urban renewal land. To make this pleasant campus, 35 acres of tenements, shops, and warehouses had to be torn down. Grad & Grad architects did submit a plan for a high-rise university that would not have required so much demolition, but that plan was rejected in favor of lawns and quads. 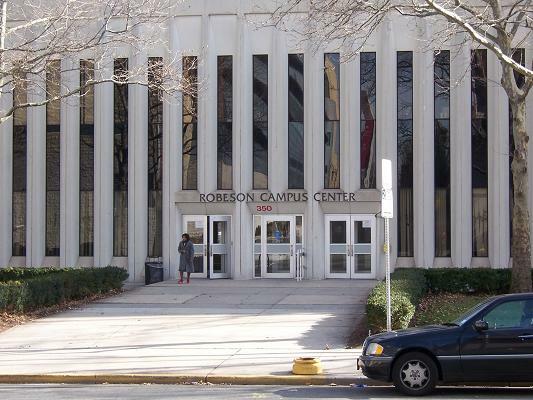 This building is Robeson Hall, named after Paul Robeson, from of Rutgers' (New Brunswick) most famous alumni. Paul Robeson was a minister's son from Princeton. He had wanted to attend Princeton University, but Princeton didn't accept blacks. At Rutgers Robeson was a stand-out athlete, actor, and student, delivering his class graduation's valedictory address. After Rutgers Robseson became an actor/activist. He gravitated towards the Civil Rights movement's communist wing. When Robeson visited the Soviet Union under Stalin he ignored the USSR's own hideous human rights record. 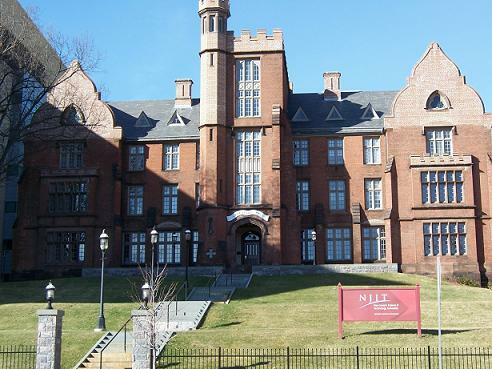 This Elizabethan gothic building is Eberhardt Hall, NJIT's administration building. Eberhardt Hall was built as an orphanage in 1857. Its $31,000 cost was paid by public subscription. The architect was John Welch, the same person who designed the High Street Presbyterian Church and the South Park Presbyterian Church. This was a very modern building for the Nineteenth century, with gaslight and hot and cold running water. In the mid-Twentieth century parentless children began to be placed more and more often with foster families or adoptive families. In 1948 the old orphanage was sold to NJIT. Rutgers-Newark and NJIT have adjacent campuses separated by MLK Jr. Boulevard. Most Rutgers-Newark buildings have their back doors to MLK Boulevard, but NJIT buildings give MLK Boulevard their best face. Most of the frats on the street are affiliated with NJIT. This used to be a handsome residential street. 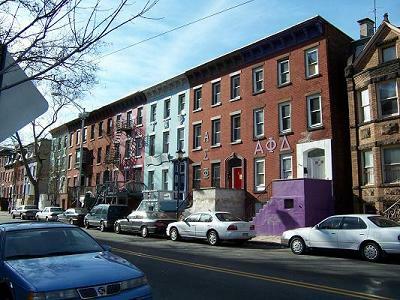 I have nothing against frats, but I wonder if these buildings would better serve Newark as private houses. 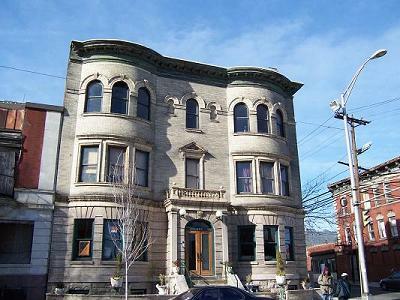 Newark needs middle class housing stock. 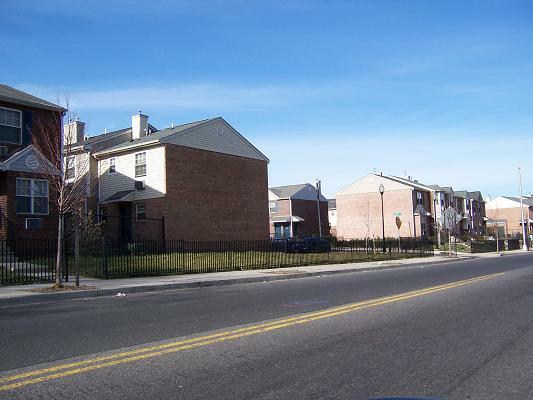 All of these townhomes have spacious backyards. Fortunately, not every stately building on MLK Boulevard is a frat, here the old Cryer mansion, at MLK and James, has been converted into attractive, modern apartments. One last NJIT frat. 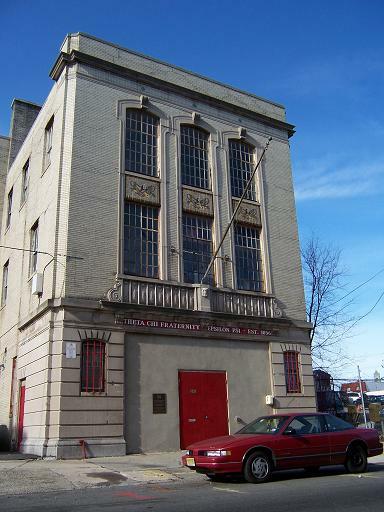 This firehouse was formerly the home of Engine Co. No. 4 and Ladder Co. No. 2. It now houses a chapter of Theta Chi. 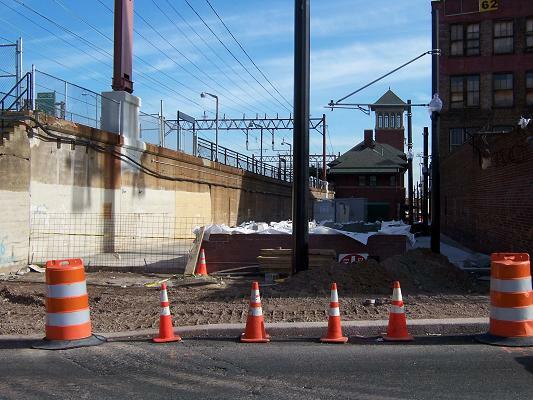 The Newark Subway is undergoing its second expansion in less than a decade as a new subway line is constructed between Penn and Broad St. Stations. Hopefully, this new subway line will be an asset for the Broad Street Station area and we'll see redevelopment of the unsightly Westinghouse Warehouse. 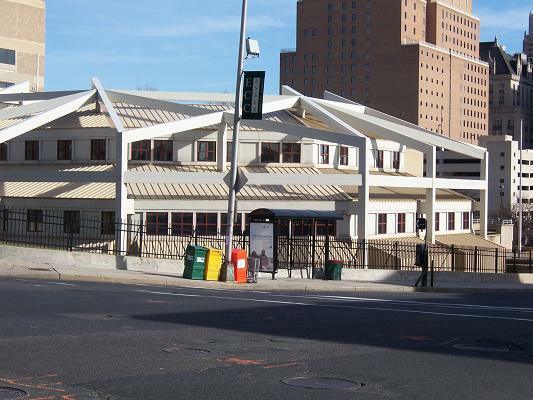 The Colonnade and Pavillion Apartments were built on one the the highest points in Newark. The architect was the internationally famous L. Mies van der Rohe and the developers were Herbert S. Greenwald and Samuel Katzin. Built as part of the "New Newark Movement, the Colonnade apartments, with New York City as their "fourth wall," were heralded as something that would anchor the middle class to the decaying 1950s city. suburbs or commuting to the city from New York and other places. with homes in the suburbs, whose children have grown and moved away. 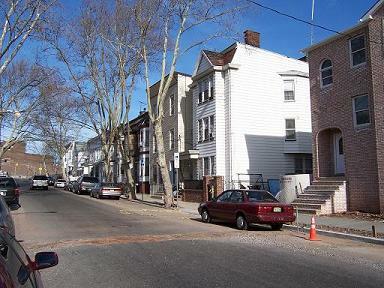 At roughly the same time as the construction of the Colonnade Apartments the Newark Housing Authority built the notorious Christopher Columbus homes. The Columbus Homes - or monsters, as the First Ward residents called them - were built in the early 1950s on what was one of the most densely populated districts in Newark. Eighth Avenue, the street that used to run through this area, was not the first choice of the urban renewal planners in the Newark Housing Authority. 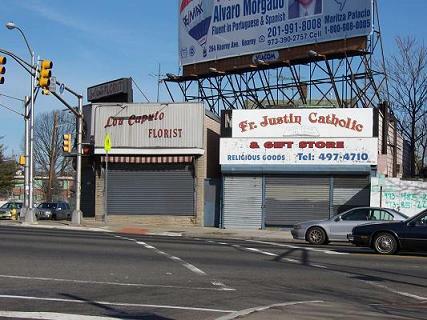 Unfortunately for the First Ward, the federal government would not pay for urban renewal in the worst parts of Newark, so a lower middle class section like this had to be found. It seems that the First Ward Italians opposed the obliteration of their neighborhood, but their power structure did not listen to them. Newark's two most powerful Italian politicians, Congressmen Peter Rodino and Mayor Ralph Villani, wanted urban renewal. Even the priest of St. Lucy's Church was dazzled by the modern architecture. The Christopher Columbus Homes were never in harmony with the rest of the neighborhood. Occupancy was low and the hideous high rises were demolished from 1994 to 1996. These townhouses were built on the site. Once Italian, this part of Newark was heavily Puerto Rican in the 1970s and 1980s, it is now increasingly Peruvian and Ecuadorian. 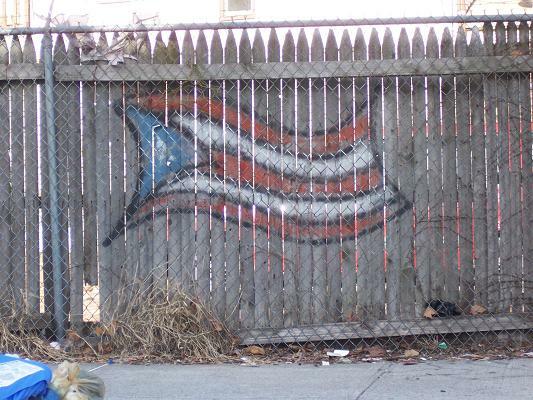 Puerto Ricans say of their flag "Que bonita bandara" - "What a pretty flag!" - and frequently incorporate it into their folk art. The northern end of MLK Boulevard is a quiet, unpretentious residential street. Notice the new construction on the right - this part of Newark is already coming back. MLK Boulevard's terminus is here at Bloomfield Avenue. The gated store on the right is called Fr. Justin Catholic.